A bit of a blog about my first foray into the world of race organisation. I have participated in events in a variety of different roles from (obviously) running but also crewing and supporting. These duties have varied in nature from setting up Checkpoints, timekeeping, making cups of tea, providing morale support, looking after injured runners, dealing with blisters/vomit and course sweeping. Prior to this year however, I had never organised a race event myself. 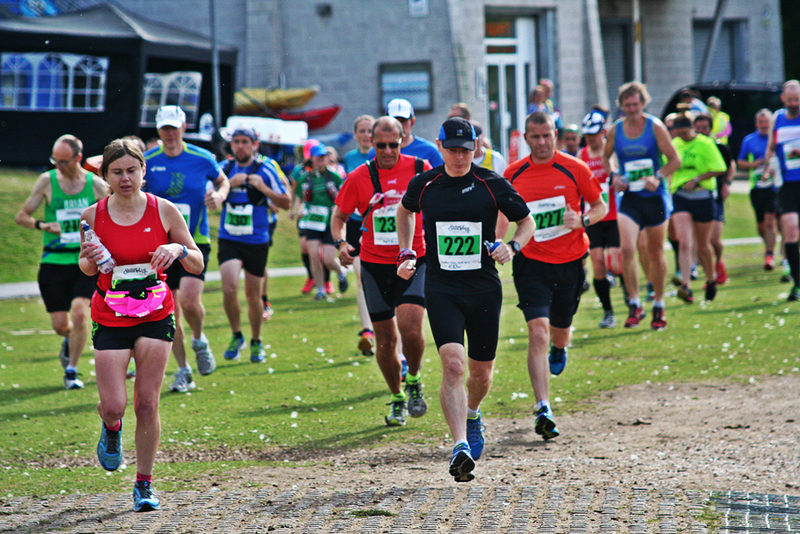 I’ve started to really enjoy the low-key marathon scene such as the Engima events (run by Dave Bayley) or Phoenix events (organised by Rik Vercoe) and I’m down to run my first Saxon Shore event next year (shout out to Traviss). I have used these mainly as training runs for ultra events and they offer the perfect combination of a run in a ‘competitive’ race but without the logistical issues of big city events and they have all been quite sociable and friendly from my experience. 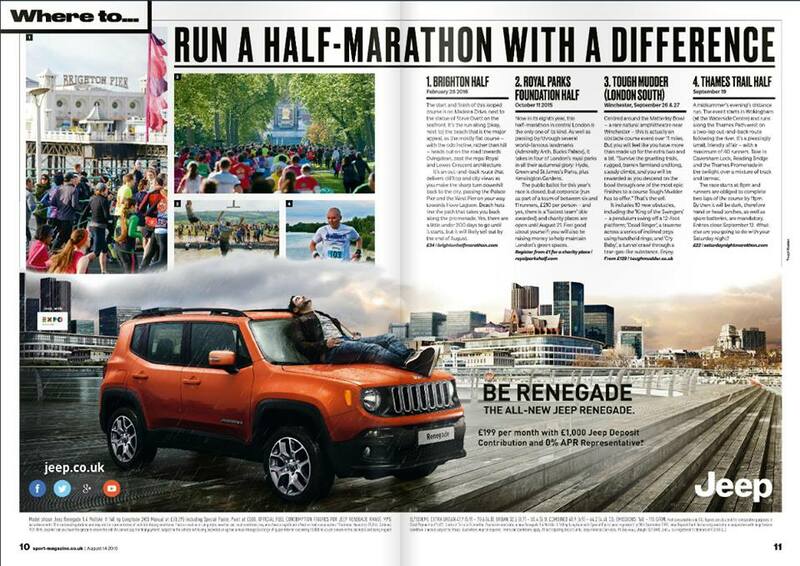 Unfortunately, my local town of Reading is not well catered for in terms of marathon events (although there are several Half Marathon events with Reading, Bracknell, Windsor, Oxford for example) and I’ve ended up having to travel to different events. At the start of the year both of these ideas sort of came together to tick “Race Directing” off my bucket list and put on a local race and I started a plan to set up my first races. In my school days I recall learning about the classic marketing mix of the 4 P’s (Product, Price, Promotion, Place) and whilst they’ve probably reinvented these principles to sell courses to the current generation of Marketing Guru’s, it’s a good starting point to describe my plans and approach. The ‘Product’ was to host a marathon event and it had to be off-road as there’s a whole host of rules, regulations and restrictions with organising a road race. 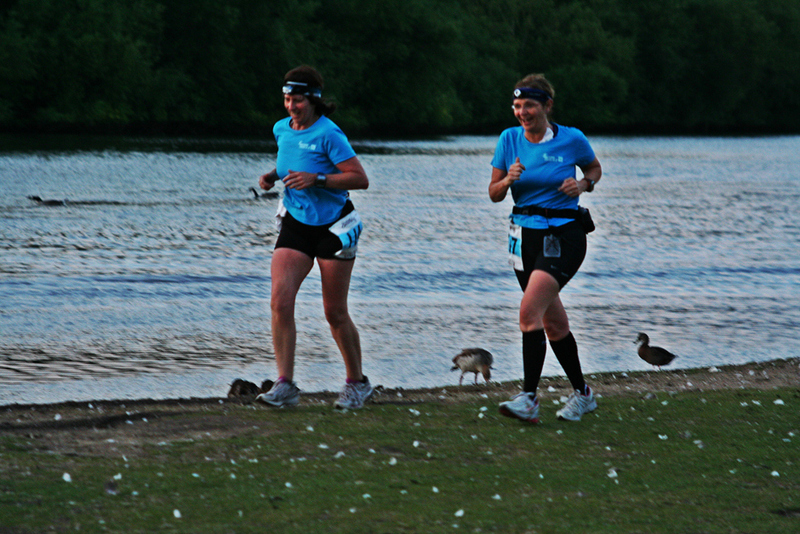 However, I wanted to offer something a little different to the typical early Sunday morning marathon and the concept of a Saturday night marathon was born with runners have a little taste of a summers evening to night running along the Thames Path (so essentially an off-road route into the dark). 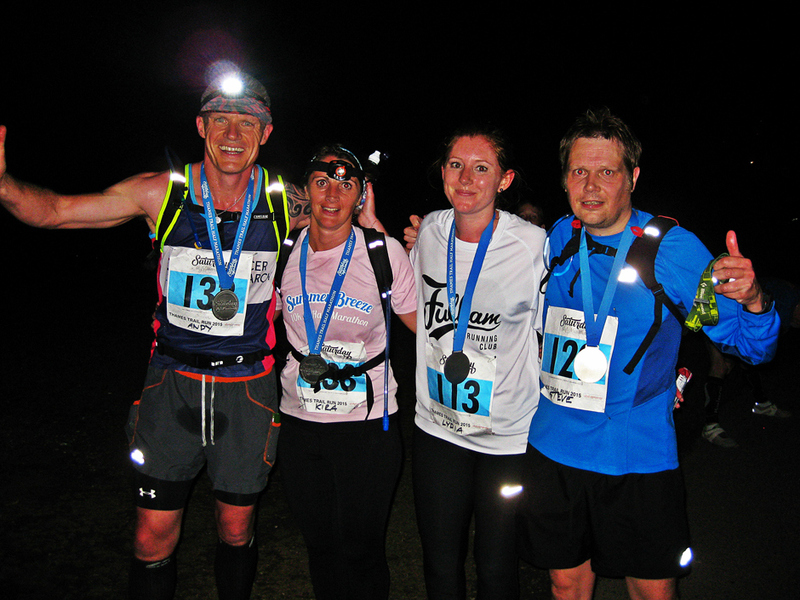 One of my key themes was to retain the low-key, friendly, social aspect of these runs and perhaps even a subtle attempt to get road runners to start to think about trail runs, night runs and then ultra events! 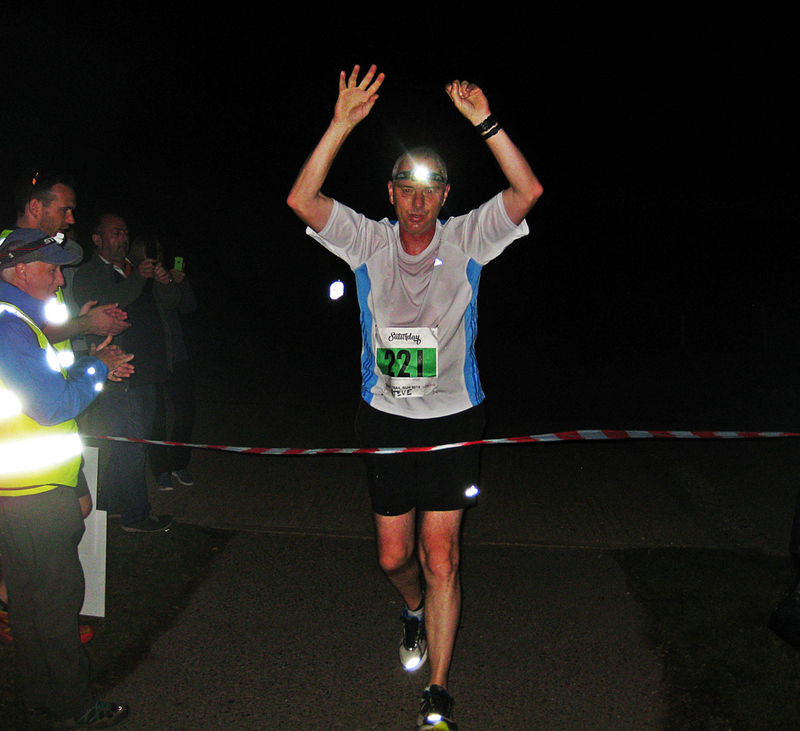 Jo Hendrie finishing the September Half Marathon. From an organisational perspective a simple ‘out and back’ type event was the easiest to organise and required the least infrastructure. I also wanted to design a ‘bespoke’ medal. There has been a little bit of a trend with bigger and more ostentatious medal designs and I must admit I am a bit of a sucker for different and unusual medals. For my race, I wanted a medal with an individual design and sufficiently heavyweight so people would appreciate the medal but perhaps not too over the top and went with the design shown below. We had some great feedback from people on the medals and I was quite pleased with how it came out. The only difficulty was from a cost perspective. Creating a new design cost money and so I was forced to come up with a standard medal design which I could re-use each year although I had planned to change the ribbon design and marking each year so there was some differentiation on the year people ran for repeat runners. 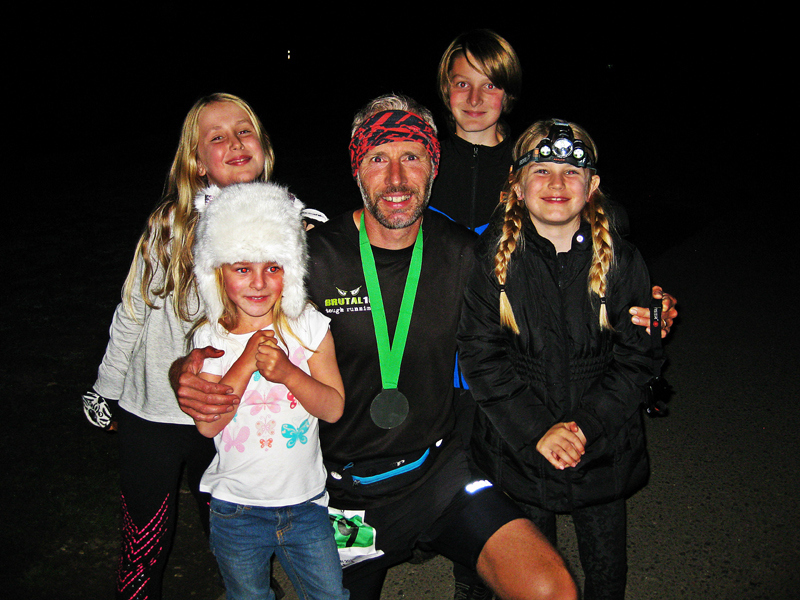 Keith from the Ultra Marathon Running Store kindly offered to sponsor the events and supplied some prizes and a discount code to participating runners which was useful especially as a head-torch was a mandatory piece of kit. With a social and friendly race theme, I decided not to offer prizes for positions but instead elected to award the prizes to a starting runner drawn at random. The next marketing item to consider was ‘Place’. 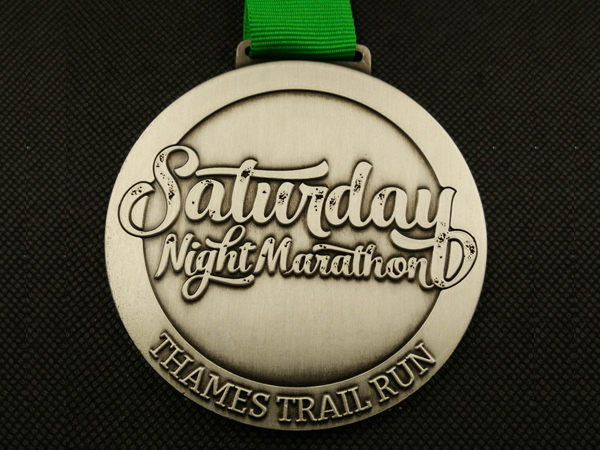 I had already decided to organise the event local to me as there was a lack of Marathons in the Reading area and with the idea of a Saturday evening run along the Thames Path the ‘Saturday Night Marathon’ theme was forming. Those of you have who run the Thames Path 100 or Autumn 100 will have visited the Reading Checkpoint at the Wokingham Waterside Centre and this proved to be a perfect start and finish location with a room big enough to use as Race HQ along with parking, changing rooms, toilets and kitchen facilities. The ‘out and back’ lapped nature of the race meant I only needed 1 further Checkpoint. First race briefing.. no one has fallen asleep yet. The ‘Price’ was straightforward. Essentially you work out your anticipated costs for setting up an event such as kit, equipment, food, water, medals, race numbers, payment fees and then consider the running costs of the business such as bank charges, insurance, permits, website fees etc. This is somewhat driven by your planned infrastructure and numbers. 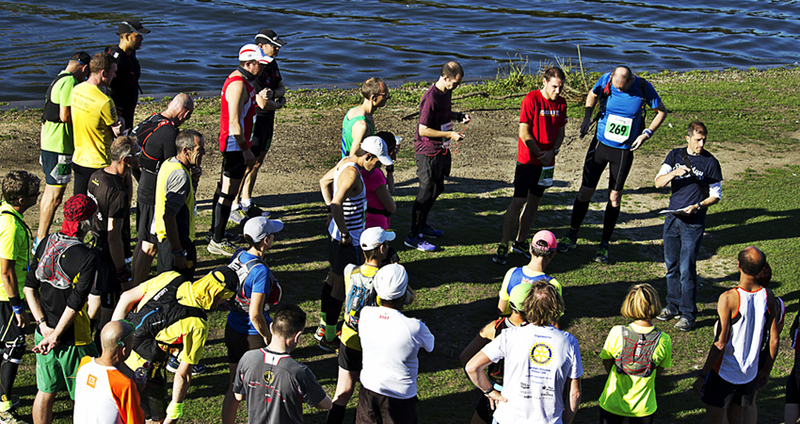 I had planned to keep things small and simple and had settled on a plan of no more than 40 runners for the Marathon (mainly due to the volume of people running along a public route) with an out and back course (so two Checkpoints). You then consider other market costs (i.e. what everyone else charges) and set your price accordingly. Looking at my limited numbers, year one-set up costs and taking a prudent approach not to expect full numbers at every race meant the numbers didn’t stack up and I elected to organise two events at the same time with a Half Marathon and Marathon option at staggered times to minimise the impact. This also gave me access to a wider selection of runners. For example my local running club (the Reading Joggers) has say 150 members of which 10 or so may have run an Ultra, another 20 or so may have run a Marathon but I would say a good 50-100 people would have run a Half Marathon with the local Reading Half Marathon attracting 10-15,000 each year. An added bonus with staggering the start times was that the steadier paced marathon runners would have some company on the course with the Half-Marathon runners starting a few hours later, particularly as it would be dark at this point. Whilst profit wasn’t the main driver (and with small numbers then you have no economies of scale with purchases) you have to ensure that the events at least cover their own costs as a minimum otherwise you are out of pocket. From initial feedback I had received, people didn’t necessarily want goody bags/race t-shirt and with limited numbers, sponsor or economies of scale are pretty non-existant so this would have had a direct impact on cost. And they’re off on the first race. Next up was promotion and getting the word out about the events. This was simply a case of getting word out via social media, local running clubs and a few of the race listing websites. With several running clubs in the area including the Reading Joggers, Reading Roadrunners, Bracknell Forest Runners and Newbury Runners I thought that a good portion of my entrants would come from this area along a few 100 Marathon Runners and perhaps a few more non-club runners. I should add a big thank you to Dave Bayley (of Enigma Running) for helping put the word out to his loyal group of marathon runners (yes Dave… I still owe you a pint) which definitely contributed to getting a few entries in from the number of 100 Marathon runners who took part (although 100 Marathon runners to a new Marathon are like bees to some honey). I did get a logo designed (thanks Mark Burnell) and had some promotional merchandise made up (a few T-Shirts/Hoodies/Woolly Hats). Ultimately, with low volumes there was little margin over the cost price of these items and it simply wasn’t worth the effort to organise these for what might have been limited demand. However, I did proceed with getting some T-Shirts made up for the volunteers as whilst a free entry was on offer for helpers, some people were just happy to help out and being involved in the race and it was nice to give them a memento for their efforts (aswell as making sure they were fed and watered during the evening). Essentially, it all helps spread the word and I picked up a few entries from each of these articles. Entries started trickling in over the first few weeks but I eventually got to a position when we were pretty much full and then had to start a small wait list. This was a bit of a relief as it meant I could cover my setup costs and wouldn’t be personally out of pocket. There are a number of ‘behind the scenes’ tasks and responsibilities which I haven’t mentioned such as setting up a company, affiliating with a Race organisation (I elected to go with the Association of Running Clubs), liaising with police, council, landowners and so on. I should add another public thanks to Karen Webber for giving my some general advice on organising marathon events. Having the benefit of some advice from someone who has done this many times was useful, so thank you Karen! I would also like to thank Matt Brown (fellow runners, crew member and my right hand man) and Matt Dunn (Marathon veteran) for being the guys I bounced a lot of thoughts and ideas off in the build up to the race. As the first race day approached, it was time to start organising the logistics of the day including the race day schedule, provisions and the volunteers. A few friends and members of my running club offered to volunteer which was great as having a good group of volunteers is key to organising a successfully event and the people who helped out at both events did a fantastic job based on the positive feedback I received from the runners (and another thanks guys comment). The awesome volunteers in action. I had prepared a plan and organised the shopping for provisions. 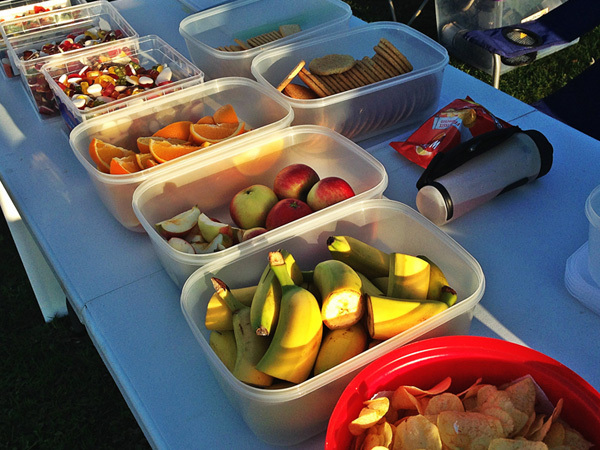 Whilst the provisions for the event were minimal (water/jelly babies/haribo etc), I had planned to serve tea/coffees and snacks as a post-race refreshment. With runners finishing in the evening when it was dark and cool, then I was keen to ensure the runners had a hot to drink and something to eat after the race. 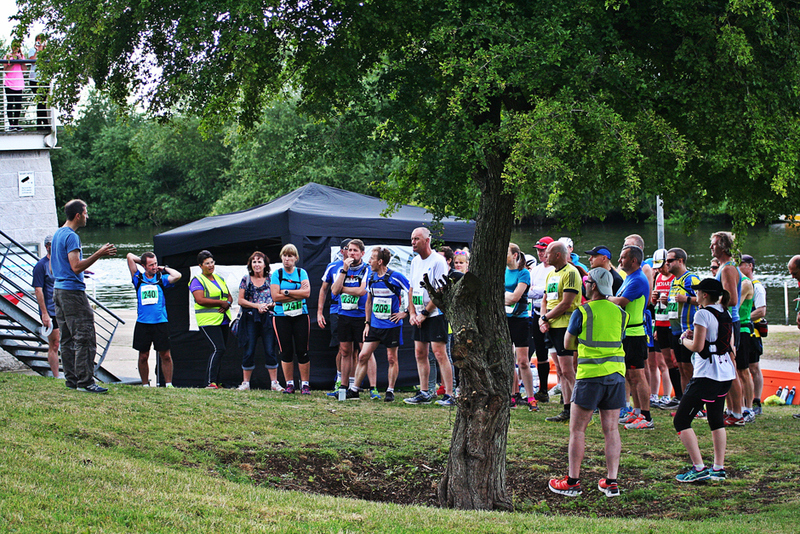 The Race HQ also provided an opportunity for runners to sit down and chat and watch other runners coming in aswell so an added chance for people to socialise. The last week before the first event was spent checking the route, a few late email enquiries, planning and double checking my plans as I didn’t want to have missed anything out. The only issue I had in the build-up was a necessary change to the original proposed route. Works to Reading Bridge had been over-running by several weeks which meant access under the Bridge was closed and forced a route change in the opposite direction. Effectively my planned ‘out and back’ route with 2 Checkpoints became an ‘out and back’ with two turn points and a Start/Finish location in the middle. This also meant a short bonus ½ a lap at the start aswell. It was a minor inconvenience and not as neat as I wanted it but the route was actually nicer with more space and we have now adopted this as our normal route. The major last minute concern was the weather as the day before the race saw the heaviest amount of rainfall in Reading since 2007 (I blame the hat). I had always considered wet weather as a factor and had made sure I had sufficient coverings for volunteers/checkpoints but I really wanted people to enjoy a lovely summers evening run and get some great pictures to update the website with after the first event. Thankfully my prayers were answered and the weather on the day of the race was absolutely fine it was almost an eye of the storm moment with heavy rain the day before and day after the event. I arrived early to meet the volunteers and go through roles and responsibilities. The volunteers were brilliant and everyone set to task without issue, runners started to arrive, registration got underway and the start/finish area and turn points were setup. It was great to see some friends and fellow club runners taking part including Steve Harlowe a runner from my club who had elected to run this event as his first ever marathon which was great to see and exactly what I wanted to encourage (he finished thankfully otherwise I wouldn’t have mentioned it). One of my highlights was seeing Steve complete his first marathon. The events went well and without issue which was a relief. The Marathon event started at 5pm with 38 runners setting off and saw a local runner (Reading Roadrunner Brian Grieves) win and whilst a handful of runners finished before it got dark, the majority of runners experienced the change in conditions from starting off in the light and running through until the sun sets. The event had a mix of experience from runners such as Tiago Dionisio (who had run his 400th marathon earlier in the morning and was aiming for his second marathon of the day), Martin Bush, Brian Mills and David Barr who have run hundreds of marathons between them to newcomers such as Steve and Nicola Fairclough who were both taking part in a marathon for the very first time. We had a couple of early DNF’s but 33 runners finished with our last runner Tracy Smith finishing a few minutes before the cut off, we always like a bit of excitement towards the end of the race. The Half Marathon runners had set off at 8pm at a brisk pace as the Marathon runners were starting to finish and soon started to spread out fairly evenly. 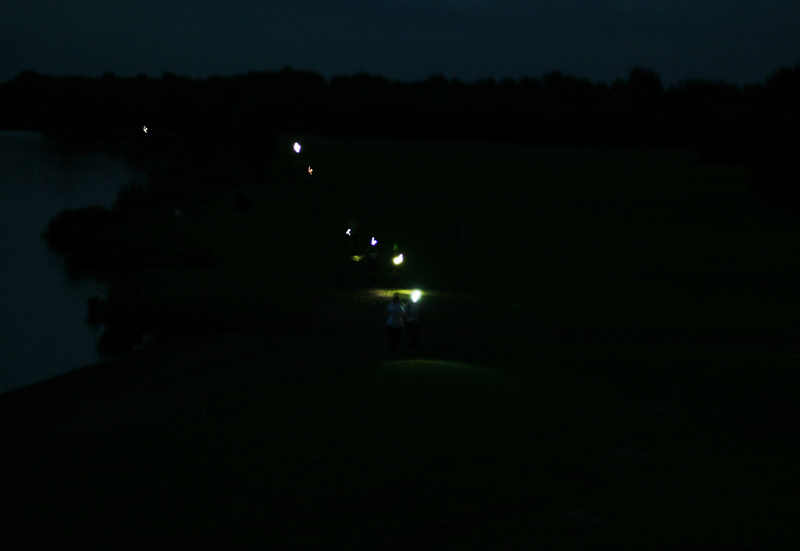 After an hour the light started to fade and head-torches were switched on as runners continued to complete their laps. Our view from Race HQ of brightly coloured runners heading towards you across a distant field was replaced with a distant procession of lights making their way up and down the course, pausing the start/finish area from time to time for snacks or water before continuing along their path. There wasn’t much of a margin between the lead group of runners with Allister Atherton coming out on top finishing 1st closely followed by second and third. Towards the end of the race it was great to see the spirit of this low-key social race in action with many of the remaining runners buddying up and running the last lap in pairs or groups. 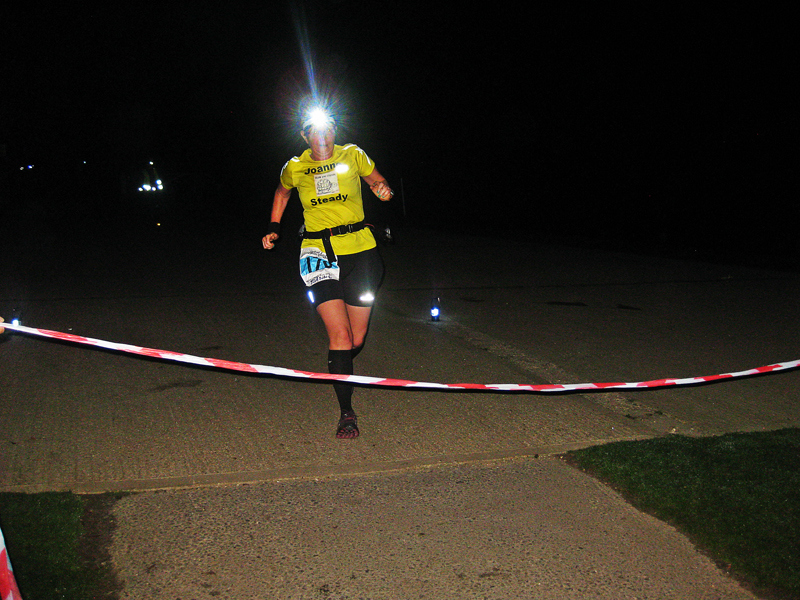 I think people enjoyed the inaugural Saturday Night Marathon and the slightly different experience of an evening trail run starting from a summers evening and finishing towards or into the night. If you are a trail runner or ultra runner then you may take this aspect of running for granted but for a number of people who have just participated in road runs then this is a new experience. Following the race a number of runners were kind enough to speak to me or email me after the event and mentioned how helpful, friendly and supportive the volunteers were and I did have a number of people quickly sign up for the September event which was great so I think overall, it went quite well. That is not to say there weren’t any lessons learned although I was pleased to see these were more tweaks and enhancements rather than major changes. A few things I picked up on were that runners wanted to see a slightly better variety of food and drinks stuffs (there’s only so much sugar you can take) and we did offer a better variety for the second event in September. In addition I decided to relax the rule about having to carry some water for the second race. This was primarily put in place as I felt it would be difficult to effectively tidy a course at night and I didn’t want a course littered with paper cups so had asked runners to bring a water bottle/pack. Upon reflection the runners passed the Start/Finish Checkpoint twice every six miles and some were happy to leave their own drinks there and so I felt it ok to relax this for future races. I also elected to oversubscribe future races by a few places on the basis that there is always going to be a few drop outs and not operate a waiting list which involved a lot of last minute emails at a time when I wanted to focus on the race logistics. After a late finish, I was out on the course the next day at 6am checking the route for any litter and was pleased to pick up very little that I could attribute to the event (I did end up collecting a couple of bags of rubbish but a lot of this was used BBQ’s and Beer cans and down to late night revellers than runners). Roll forward a couple of months and the second running of the race in September was pretty smooth as I had been through everything once already. We were once again fortunate with the weather. After a week of wet and miserable weather in Reading, the sun shone for us once more as we enjoyed a lovely late summers evening at first. 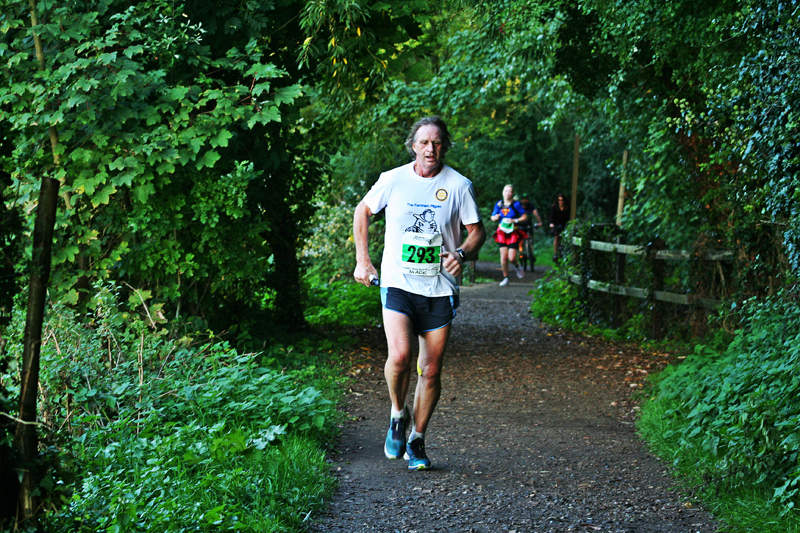 It was great to see some runners returning from our first event and a number of runners from local running clubs (Reading Joggers and Reading Roadrunners) supporting the event. The lack of travelling being an obvious bonus! 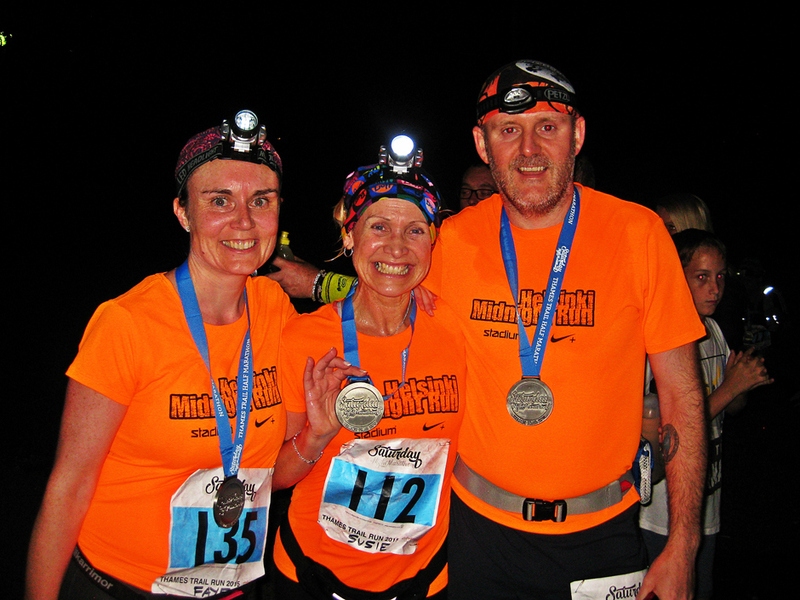 With the second event being run in September, it got darker a lot earlier with head torches needing to be switched on for the Half Marathon event from the start. The race descended into a procession of lights running up and down the course through some cool misty fields. The headlight train coming into the Checkpoint. 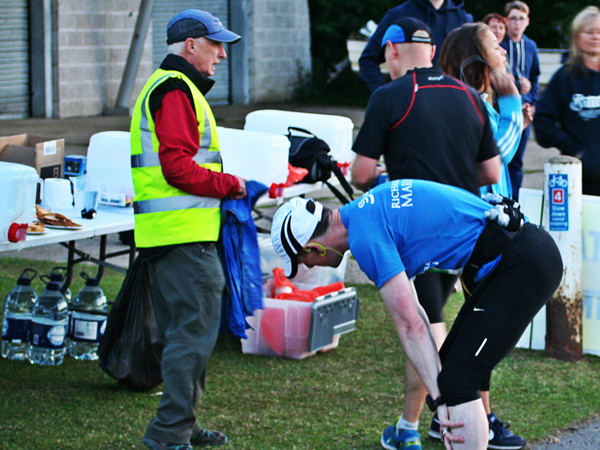 The only major incident we had was one runner who managed to forget a vital piece of equipment… his running shoes! Thankfully, I managed to loan him a pair of my shoes which were the right size to get him on the start line otherwise it might have been a quick trip to Tesco just around the corner for an alternative pair. We had a couple of minor issues to deal with during the race on this occasion. A couple of runners failed to follow the path closest to the river and so we despatched a marshal out onto the course to have a look and put some extra arrow signs out pretty quickly and also a few of the glow-sticks didn’t work properly. This was probably not helped by the Half Marathon starting in the dark and some runners not being able to familiarise themselves with the course so a small lesson on marker placing. With the slightly cooler weather in September, the hot drinks and snacks after the event was even more appreciated and it was good to see runners hanging around and chatting after the race. Overall it all went pretty smoothly again. The only regret so far is that I haven’t had the chance to earn one of my own medals to add to the collection! Sure, I could just take one out of the box (and well put it in the shoe box under the bed with the other medals) but I wouldn’t have earned it. However, my right hand man Matt Brown has kindly offered to act as Race Director for one event next year and this does give me a chance to have a little run. I will be honest and say I feel a little awkward about running in my own event (I don’t want there to be any perception of preferential treatment for example) and this may well be a training run type effort and have a bit of fun on the course with the other runners. It would be great to see a few more familiar faces take part in 2016 and I may even be on the start line at one of them. Smiling… even after the run!